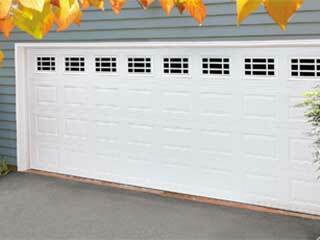 Garage doors are available in a wide range of different materials and styles. While it’s easy to find something to tick all the boxes, it can be tricky to work out what it is exactly that you need. A new door is an investment, so we want to help you make the right decision. First of all, decide upon the material to best suit your remit; lightweightaluminum, low-cost plastic, traditional timber or hard-wearing steel. There are a number of things to consider when choosing the right material for your new garage door. Door Weight: Heavier doors, including those made from wood and steel, tend to be more costly. The more your door weighs, the stronger its opener needs to be. Safe and Secure: The stronger your door, the more difficult it will be for intruders to break in. Therefore, take into account the quality of your locks and security measures. No-Hassle Maintenance: While sturdier materials such as steel are vulnerable to rust, aluminum can corrode over time. Plastic is easy to clean, while wood needs to be regularly refinished to stop water seepage. As you can see, when choosing a new door material, it's important to bear in mind the different levels of maintenance required to keep it in good condition. Steel, aluminum, plastic and wood are the four main door material options. Some companies may even use more than one material at once, occasionally including glass in their options. Not only are plastic doors cost-effective, they also come in a huge variety of styles. They benefit from not needing a particularly strong opener and are very light. However, being less strong than some other materials, they can also be more susceptible to damage. Why Choose Aluminum Or Steel? Aluminum and steel, both metals are strong and resilient. Steel may be the stronger option, but it is also heavier. If you are looking for a lighter door, opt for aluminum. Strong, tough and traditional, a wooden garage door is a classic choice. The only downside is that they are quite a lot heavier than their metal or plastic counterparts.